Post-Taliban, a nascent publishing industry has emerged in Afghanistan, with hundreds of titles being published in Dari, Pashto, Uzbek, and English. A fledgling publishing industry is taking its first steps in Afghanistan. Commercial publishing in Afghanistan began barely two to three years ago. Publishing was a state-controlled activity in the country before political conflict engulfed the nation, which was first a monarchy before coming under a communist government. The period after the Soviet invasion in 1979 and the subsequent civil war that followed, finally leading up to the Taliban regime and its obliteration by NATO, practically brought a halt to book publishing in the country. Now coming out from decades of political turbulence, with the process of rebuilding taking place, book publishing, too, is emerging as an industry in Afghanistan. Led by the enterprising Dr. Ajmal Aazem, a pediatrician and publisher from Kabul, an Association of Publishers was formed four years ago. The association currently has 25 members with Dr. Aazem as the founding president. The Tehran Book Fair in 2011 was first-ever book fair that they participated in, followed by participating in the Frankfurt Book Fair this year. “We are making a start from here—for our country,” says Aazem. Dr. Aazem started his publishing enterprise, Aazem Publications, about 18 years ago when he was a student at the Faculty of Medicine in Kabul University. “I would handwrite textbooks and then cyclostyle it for copies. These were made as books and then circulated,” says Aazem. About 99% of the books available in the country are from Pakistan, mostly pirated titles. The remaining books are imports from Europe and the U.S. Until recently, there were no computers in the country and there were no printing facilities either. “There was not one offset machine and the machinery which was once owned by the government was totally destroyed,” according to Dr. Aazem. Alongside growth in publishing, the printing industry is also growing in the country in the last two to three years. Machines manufactured by Heidelberg and other popular manufacturers are being imported from Pakistan to meet the printing and packaging needs of the country. There are now more than 250 printing presses in Afghanistan. At the same time that the publishers grouped together, the Association of Printers was also set up in Afghanistan. Dr. Aazem serves as the vice-president of the association. 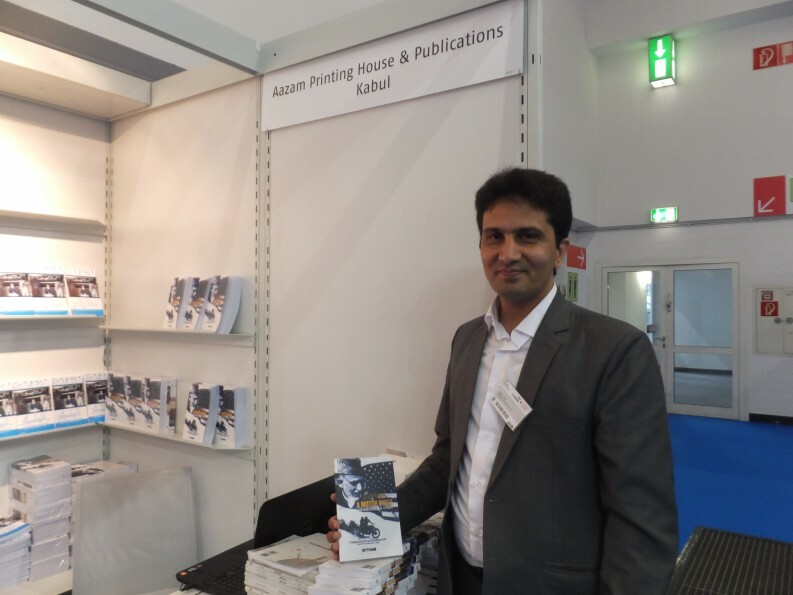 Aazem Publications has invested in a Heidelberg machine which can produce 5,000 printed and bound, full-color books within 24 hours. In the last ten years after the Taliban, the printing and publishing industry in Afghanistan has grown by almost 500%. Nearly 3,500 titles have been published in the country during this time. Lately, on an average, about 500 new titles are being originated. Children’s books, and books in subjects like journalism, medical, science, languages, literature and poetry, are being produced. In the academic subjects, like medicine and science, the books produced are primarily textbooks, which give students a basic understanding and then lead them to references of more established textbooks produced abroad and imported. Books are published in Dari, Pashto, Uzbek and English languages. With private sector schools coming up in the country, which follow international curriculum, a few students are now learning in English. Few translators are available to publishers, but translation work is picking up. However, the publishers cannot afford to pay translators much. Ensuring an adherence to follow the copyright law is a challenge. “We publish a book according to the rules of copyright, but after 2 to 3 days, the pirated version comes from Pakistan,” says Dr. Aazem. “In Afghanistan, some foreign agencies seem to support just some individuals, or agents. It is almost as if they don’t really want Afghanistan to develop. Take for example, DAAD (the German Academic Exchange Service). They work in Afghanistan, but get the books printed in Pakistan. Why should they do that? They don’t approach the publishers and printers to directly work with them,” notes Dr Aazem. He urges all foreign agencies and non-governmental organizations to help Afghanistan by getting their publications produced by the country’s publishers. Dr. Aazem asserts that Afghanistan has a lot of fresh ideas, which the international governments and organizations need to know about from them. “We love our country and we are dedicated towards publishing books. This is why we are doing it. This is culture-work. We are not in it for profit. Afghanistan needs good books, which is why we are working for it,” he says, adding that publications are a small part of the larger agenda.